Exclusive: Book by May 17 & receive a $50 optional experience voucher PLUS portable power bank. **Single Share Program: When travelling alone, we understand that some clients do not want to incur the expense of an additional single room supplement. That’s why we give you the opportunity to purchase selected vacations on a room sharing basis on the majority of our itineraries. We will accommodate you with a fellow guest of the same gender on a ‘two-bedded’ basis (non-smoking rooms only). Please note that we cannot guarantee roommates will be of a similar age group. If we fail to match you, we will provide a single room at no extra cost. 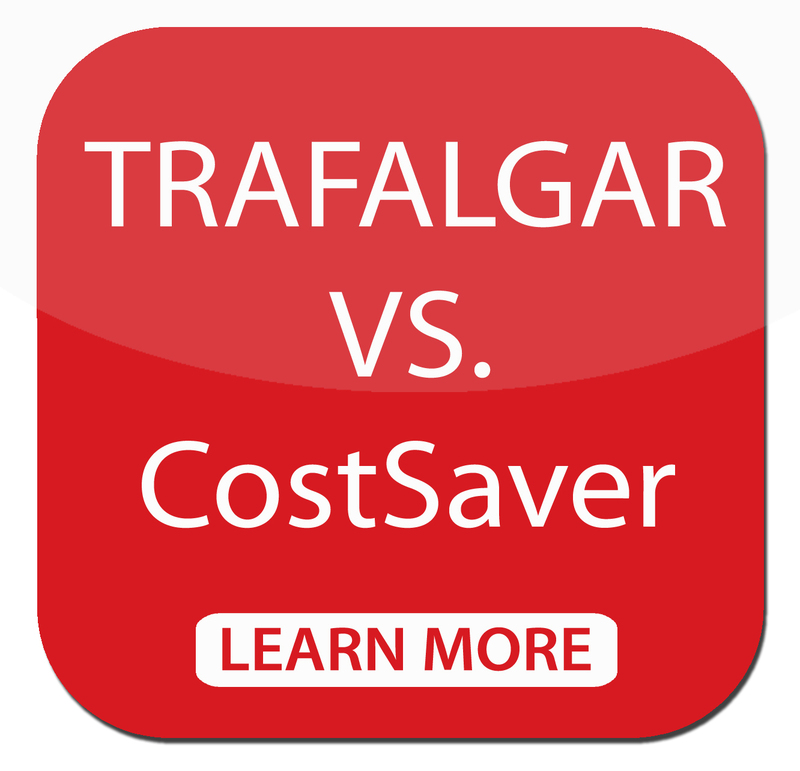 With CostSaver you get a great value vacation, without compromising on quality and still benefiting from award-winning service from a name you can trust. Your accommodations will be 3 or 4-star, featuring twin rooms. You’ll also enjoy buffet breakfasts, and while up to half your dinners will be included in the price of your trip, you’ll be free to dine out the rest of the time. As such you’ll have more time and freedom to explore on your own, or choose from one of our Optional Experiences. Though don’t worry, if you’re ever stuck for ideas on where to go, your Travel Director will be more than happy to point out their favorite trattoria, restaurant or café. Welcome to Rome. After check-in at your hotel, relax and unwind before meeting with your Travel Director in the afternoon. This evening why not take a stroll around this fascinating city and soak up the amazing atmosphere. Your Local Specialist takes you on a sightseeing tour of the city, starting with a visit to St. Peter’s Basilica, one of the largest and most inspiring churches ever built. Your trip continues across the Tiber River with views of the iconic Colosseum and the ancient sites of Rome. Spend free time exploring the wonderful sights on your own. Perhaps take an Optional Experience offered by your Travel Director. This morning perhaps join an Optional Experience to the Vatican Museums. 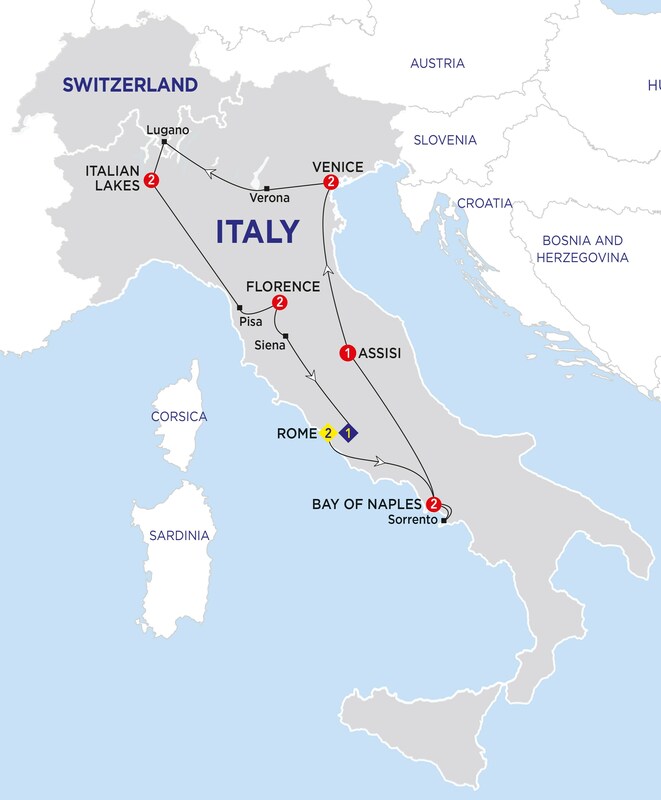 Then journey south past the Abbey of Monte Cassino to the Bay of Naples, your home for the next two nights. This afternoon why not take an Optional Experience to Positano and the Amalfi Coast? Enjoy an excursion to the nearby clifftop resort of Sorrento with free time to shop for souvenirs. Make sure you sample some of the delicious Limoncello produced from local lemons for which the region is famous. This morning consider an Optional Experience to see the excavations of Pompeii, which lay undiscovered for centuries beneath a layer of volcanic ash after Mount Vesuvius erupted in 79 AD. Later drive through the rolling hills of Umbria to the mystical town of Assisi on the slopes of Mount Subasio, birthplace of St. Francis. Enjoy an orientation tour which includes St. Francis Basilica, renowned for its fresco paintings. Enjoy a scenic drive across the dramatic Apennine Mountains to the magical floating city of Venice. Dine at your hotel this evening. Watch the Venetian craftsmen at work creating local specialities at a glassblowing workshop on Giudecca island. You are surrounded by magnificent sights and sounds as you cruise by private launch along the Giudecca canal to St. Mark’s Square. Admire the Bridge of Sighs, the ornate Doge’s Palace and the Basilica of St. Mark. Explore the city during your free time or maybe take a trip to Burano Island in the lagoon for a delicious meal. Journey west to Verona, the setting for Shakespeare’s most famous play, and stop to admire the Roman Arena and Juliet’s Balcony. Continue across the Swiss border and visit the pretty lakeside resort of Lugano. Arrive at your hotel where you dine tonight. Today you have a full day to enjoy the facilities at your hotel including the swimming pool. Alternatively consider an Optional Experience to Milan and Lake Como. Cross the Apennine Mountains, travel along the Italian Riviera arriving in Pisa. Here we see the famous leaning tower in the Square of Miracles. Later arrive at your hotel near the Renaissance city of Florence. Tonight you may wish to enjoy a wonderful dinner in the Tuscan hills. Florence is one of the liveliest and most creative cities in Europe and home to some of the world’s greatest works of art and architecture. Your Local Specialist gives you an excellent account of the city’s history during your walking tour, which includes views of the Baptistery, the Ponte Vecchio, the Cathedral of Santa Maria del Fiore, the impressive Giotto’s Bell Tower and a visit to Piazza della Signoria. Learn about the quality and workmanship of two of this city’s historic industries at demonstrations of Florentine leathercraft and 18-carat gold. In your free time, perhaps visit one of the many museums or simply relax and enjoy the ambience. Admire the beautiful scenery as you drive through the Chianti region of Tuscany to Siena, a medieval city famous for its biannual Palio horse race. Marvel at its rich heritage during your orientation tour. This evening in Rome you might like to mark the end of an enjoyable holiday with a meal out. This morning say ‘arrivederci’ to Italy, your Travel Director and fellow travellers as you prepare to return home with wonderful memories.